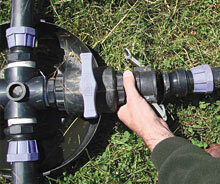 Irripod Irrigation is a division of Hansen Products. 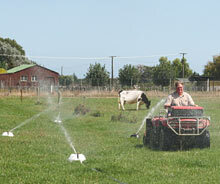 It is a flexible, cost effective pipeline sprinkler irrigation system for pasture and forage crops. 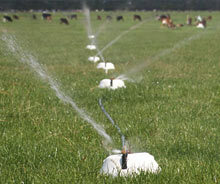 Designed to operate at low pressure, the Irripod system distributes water or effluent on a slow absorption rate over a 12-24-hour period. This allows for effective absorption into the soil whilst eliminating pooling and run off. The system only requires movement once per 12-24 hour period. Multiple options are available and the system can be easily configured to suit your irrigation requirements.